Selling for $4.99 0 0 Like this product? Each valentine heart pack includes 20 fold and seal cards and 48 stickers. Choose a boy and a girl themed pack to make every child at school have a happy day! 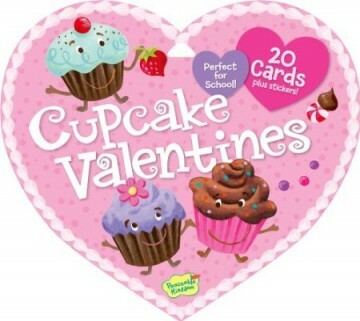 A fun valentine pack featuring super sweet cupcake themed cards is perfect gift for your special one. - Choose a boy and a girl themed pack to make every child at school have a happy day! Peaceable Kingdom Valentine Heart Packs include 20 fold and seal cards and 48 stickers for decorating to make Valentines giving even more fun! Personalize each card with a fun valentine sticker, sign the cards and fold to seal with one more sticker and they are ready to give! Since 1983 Peaceable Kingdom has created fresh, fun, award-winning products for kids that educate, inspire and tickle funny bones! The company was founded on a single product - a poster featuring the beloved art from the classic children's book Goodnight Moon. Almost 30 years and more than 5,000 products later, we have grown to be a leader in juvenile stickers, greeting cards, and cooperative games. - We have fun while we work!